Hey, did you guys know Bruce Willis came out with a perfume? Yeah, me neither. The reason? The distribution company for this fragrance does not service North America. So, amusingly enough, tracking this stuff down is even harder than tracking down some niche perfumes. In Bottle: The scent bills itself as elegant, green and woody. And green is what I’d definitely call this opening. Straight out of the bottle and it is a clean, sharp green grapefruit fragrance with a dash of pepper. There’s a touch of sweet orange in here. Some people have noted that it reminds them of Terre d’Hermes. I can see that. This also reminds me of John Varvatos Artisan without the pepper. But when I said sharp, I really mean sharp. I was actually surprised it didn’t go with the lowest common denominator (aqua and citrus) and the opening is pleasant with a bit of a kick. Not bad. Applied: After the initial blast up your nose with the pepper and citrus, Bruce Willis (heh) mellows out a little but remains spicy as the rest of its notes come in–when I say notes, I really meant, note because from hereon in, I smell one thing predominantly. But let make a note about the grapefruit. The grapefruit is a bit of a lingerer, holding onto the top to clean up the black pepper a bit and I do like the opening it’s competently done. However, Bruce Willis goes into the mid-stage smelling more woodsy with the cedar note slowly amping up until it reaches maximum tolerance, then keeps going up. And here comes the cedar, loud and sharp and obnoxious and I’m sorry. I think I’ve already established that me and cedar don’t belong together when its overused and Bruce Willis overused the cedar. This fragrance is really strong, and the powerful cedar does not do it any favors for me. Mingled with the pepper and this stuff gets almost unbearably loud. Nothing special, just really loud. 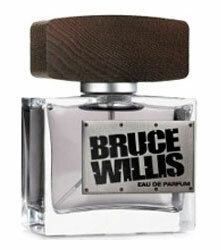 Bruce Willis Cologne has fantastic longevity, I’ll give it that and its projection is massive. I sprayed this twice from a tester vial and people could smell me from across the room. When this stuff does calm down hours later, the cedar mellows out a little and I can smell some earthiness peaking through before it disappears too and leaves me with the merciless cedar until I scrub it all off. Extra: I saw what it was made of and noted the cedar and decided that I did not need more than 2mls of this and I’m glad I only got that much. Bruce Willis Cologne is probably not bad. I just have an unfortunate intolerance for loud cedar. Otherwise, this fragrance is decent. It’s not special, it’s got a pleasant opening but by mid-stage it falls apart on me. If you want something with longevity and projection, this is a good contender. Design: The bottle’s shape is quite nice, simple, elegantly designed, the cap adds a bit of masculinity to the design. The overall shape and aesthetics of the bottle is rather nice. The metal plate bearing the fragrance’s name and concentration is a tad ludicrous but it could have been a lot worse. Overall the design is pretty decent. Notes: Grapefruit, orange, black pepper, cedar, gum benzoin, vetiver. And there you have it, a Bruce Willis perfume. A really difficult to find and procure Bruce Willis perfume for people living in North America and given how it smells, I don’t think it’s worth importing it at a hefty price tag. You could get a more well-behaved fragrance that smells close to this with Terre d’Hermes. So unless you’re a Bruce Willis paraphernalia collector, I think the fragrance is a pass due to how hard it is to get and how unspectacular it is by comparison. Reviewed in This Post: Bruce Willis, 2010, Eau de Parfum. This entry was posted in Reviews By House, spin off, woodsy and tagged black pepper, cedar, grapefruit, gum benzoin, orange, vetiver. Bookmark the permalink.